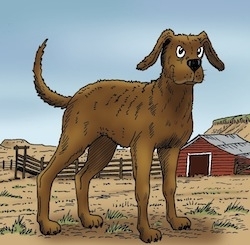 We've provided this illustration (click here) straight from the cover of The Original Adventures of Hank the Cowdog for you to use and turn into a Hank the Cowdog Christmas Card! You may use the image in any way you like: crop it, add words, borders, decorations to it, and anything else you want to do to make it a fun and festive Christmas card! There will be a Grand Prize winner for the Best-Overall-Card (chosen by Mrs. Erickson, a.k.a. Sally May) who will receive a prize package containing: 1 autographed, hardcover copy of Hank #62 (“The Ghost of Rabbits Past), 1 audiobook of Hank #62, and 1 pack of Hank playing cards. Limit: 1 submission per fan (NOTE: One parent can submit on behalf of several children). Must submit entry by December 10th, 2013. And, even if you don’t enter, be sure to go to the official Facebook page to view the entries and comment on your favorites! Once final winners have been chosen, we’ll post the winning Christmas cards on Hank’s Blog. Please ask any questions you might have in the comments-section below, so that when we answer it, we can also help anyone else who might have that same question.